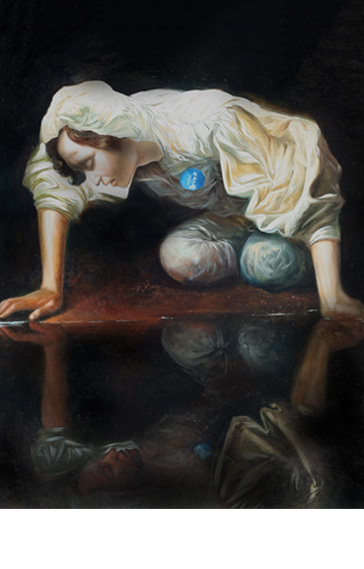 Narcissus is an oil painting, allegedly attributed to the italian baroque master Caravaggio, even though its origin is arguable yet: some Art historian and critics reckon it may belong to other painters such as Spadarino or Gentileschi. The painting depicts a modern transposition of a very well-known subject of the Greek mythology, narrated within Ovid’s “Metamorphoses”. The story is about Narcissus, whose remarkable beauty was the motive of his own demise. 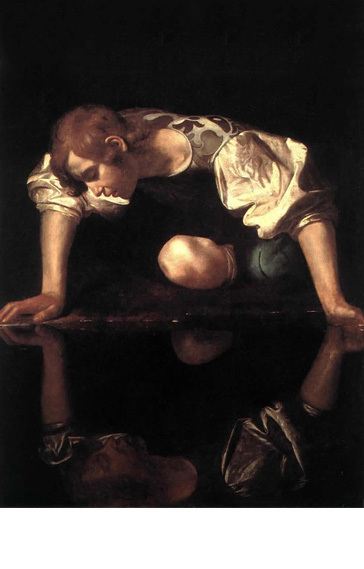 The painting displays Narcissus looking at himself on the water surface and striving to find a physical touch with his own reflection.The handsome young man is entirely surrounded by an unsettling obscurity that symbolizes his evident condition of loneliness: the whole scene is illuminated by a feeble and theatrical light, in accordance with Caravaggio’s style. The vertical pattern of the canvas allows Caravaggio to paint a perfectly shaped double-figure, just as a card-game model. Narcissus was incredibly beautiful. So much beautiful that anyone fell in love with him: women, men but even animals, plants and the stones of the mountains. However, he was tremendously pretentious and conceited, so vain to become cynical and numb. One day, he gave a sword to Aminio, one of his hopeless suitors, in order for him to commit suicide. And he did it. The nymph Echo, who helped him when he was lost in the wood, offered herself as a love gift. Though, Narcissus rejected her horrified. As the legend goes, Echo was torn apart by the unbearable pain and only her voice remained. And he kept kissing and cuddling himself until the next morning..
Narcissus walked always naked around, since his skin was so delicate and sensitive that he wasn’t able to dress any garment without bothering heaven and earth with his complaining. So, the merciful Gods decided to punish him. They designed a special clothing, the Classic Expert coverall, a light-weighted garment, made in a super breathable and protective fabric, just as the organza silk of the empress Lei Tsu. They dressed him while he was still asleep. At dawn, completely unaware of what he was wearing, he woke up lazily and started waddling on the street hunting for the admiring looks of the bystanders. Surprisingly, he realized (irritated) that nobody paid no longer attention to him but many people asked him about his fancy coverall. His wounded vanity could even kill him, so the same day at dusk he went to the spring to admire himself (and to find some soothing revenge). It was a full moon night. Though, the reflected image was slightly different: his face was just the same, perfect and straight-faced, but his body was wrapped in a strange white cloth. Narcissus asked the Moon, who was reflecting herself in the spring as well, for advice: “Who’s the most beautiful of the universe?”. The Moon answered back: “You’re the most beautiful, my Narcissus.. but the cloth you’re wearing is even more beautiful. And if tonight you’ll be looking at it with your big eyes, you’re going to fall in love with it as much as all the other people already did”. Narcissus kept staring at himself throughout the whole night, almost secretly, between his fingers. Maybe he didn’t fully understand why but the very next day he started another life off. He opened up a Resort on the spring bank: “Narcissus Place, the best is yet to come” with a privé zone for “lonesome hearts”, the nymphs to amuse the guests and, most importantly, the renowned masked parties “In disguise with Narcissus”. One day, when he grew very old, he fell eternally asleep. Next morning, Naiads and Dryads didn’t find the desired body laying by the spring but only an empty coverall and a white flower, that was named after him. And a not with a big truth: Classic Expert, a totally different life!